Why the ‘DAY 0’ title? Well this was to be mainly a day travelling to the starting point of the walk, and a laborious journey it was too. At 5.45am the alarm went off and I leapt out of bed……well more ‘fell’ out of bed really! After a quick breakfast my wife, Chris, took me to the station to catch the 6.41am train. 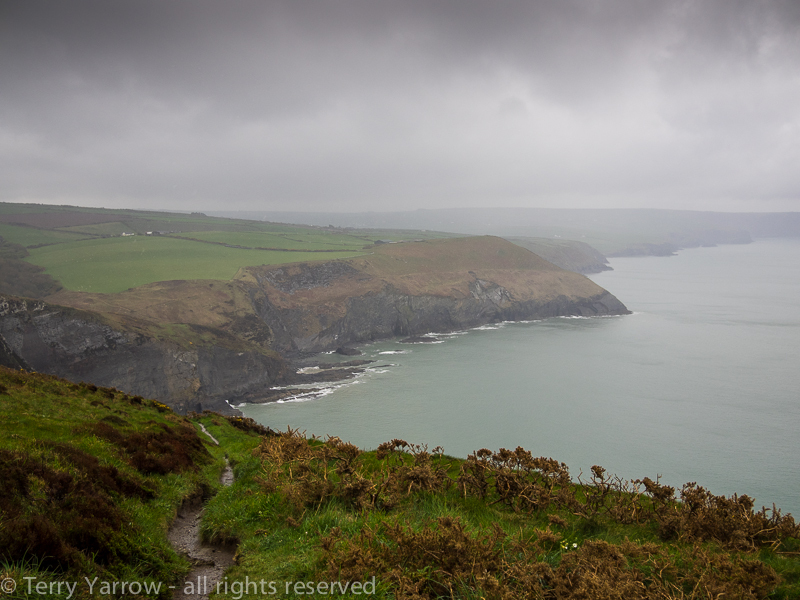 The morning was dull and grey – not very inspiring! And it was hard saying goodbye to Chris too – I wondered why I was doing it! 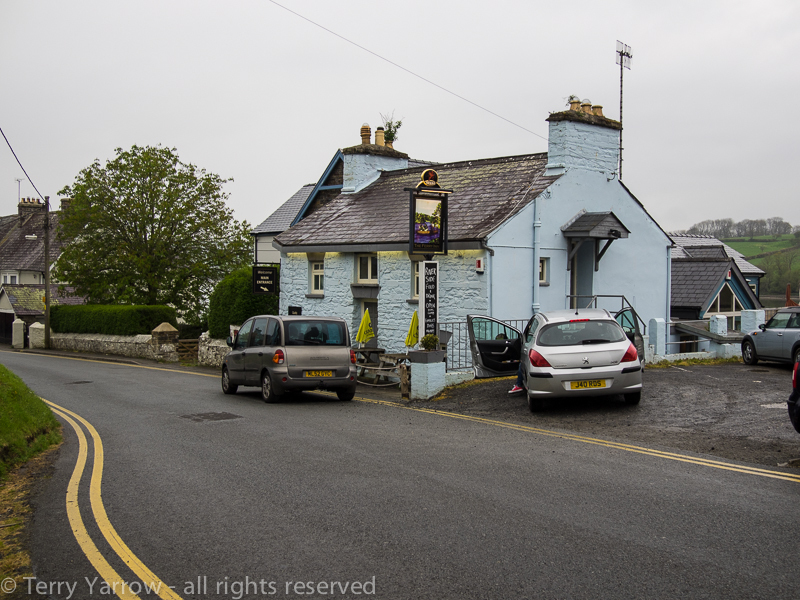 Three trains, two buses, a taxi and a walk later I arrived at the starting point in St Dogmaels, Pembrokeshire……..and I went to the pub :)! For food as there was nowhere after this point where I would be able to eat. I had a cooked meal and asked if they did sandwiches as I needed food for tomorrow, but annoyingly they didn’t. This meant that, having eaten, I had to retrace my steps a mile or two back up the road into the village to find the nearest shop. Lesson 1 – think ahead! Finally, much later than intended, and just as the rain began to fall again, I arrived back at the official starting point (or finishing point depending on which way you do the walk) and could begin my trek. 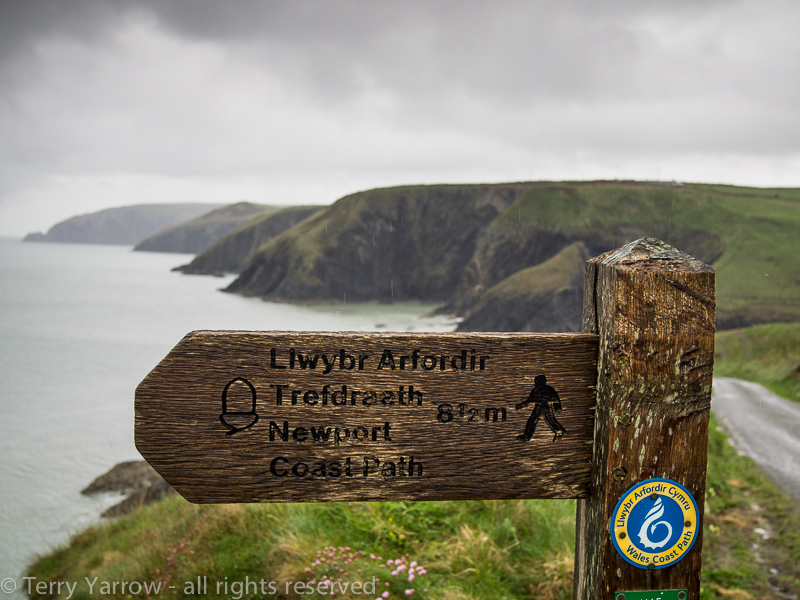 With most of the day being taken up with travelling, it was to be a short walk of around 3 miles to my first camp, a farm at Cemaes Head, but it was all uphill! I arrived at the camp in the early evening light with rain still falling, thinking about the difficulties of putting a tent up on sloping ground in the wet and about packing it away again wet tomorrow, when the farmer greeted me. “Ah’, he said, “I’ve just put some yurts up for the new season so you are welcome to use one of those for the same price as a tent as it is so wet”. Well he didn’t need to offer twice and I moved in! Yes, it was basic, but it was dry and much more spacious than my little one man tent, and I wouldn’t have to pack it away wet tomorrow :)! One of the problems with camping at this time of the year is that the evenings are chilly, and with no pub within walking distance, what do you do to keep warm? 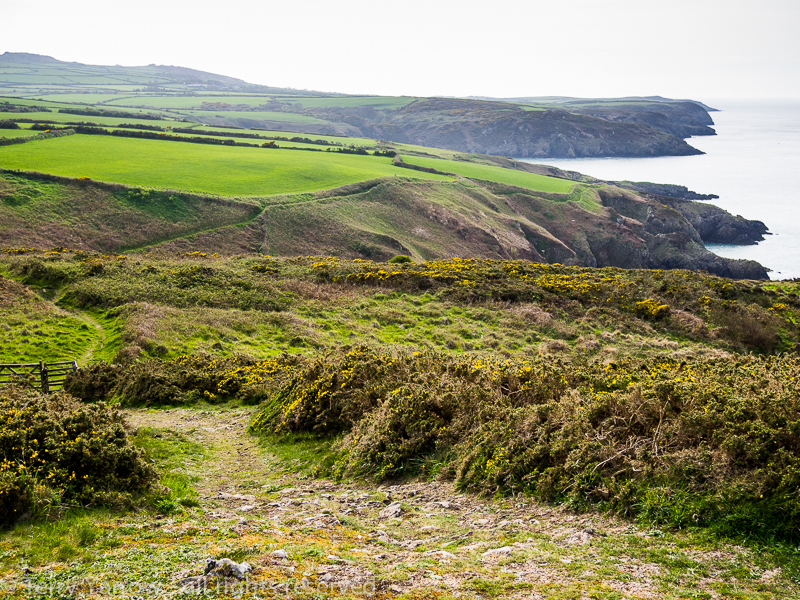 Well you go for a walk of course…….which I did, all around the headland. It has been a good day. The travel arrangements all went smoothly although not without some confusion and discomfort on the trains. What will tomorrow, my first real day on the trail, bring? 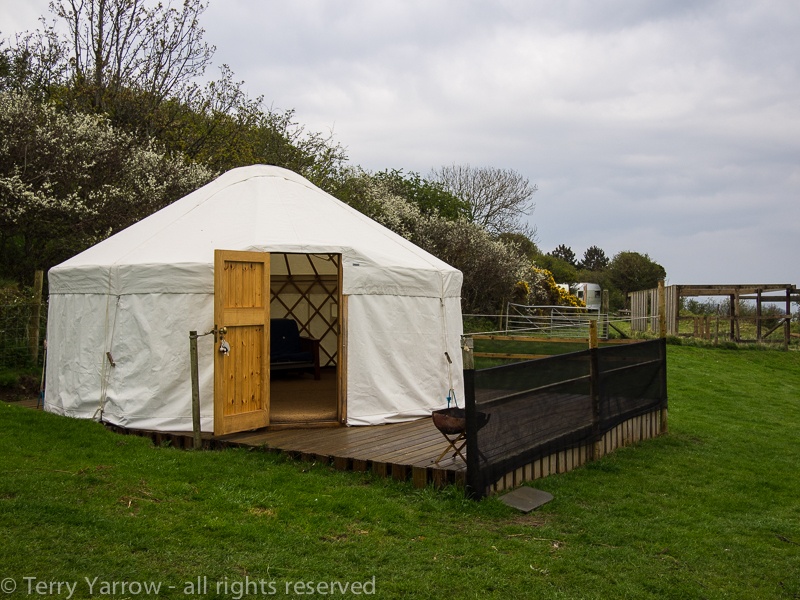 I woke to the sound of pouring rain and strong winds pounding on the yurt! Having breakfasted and packed, I donned waterproofs and set out. The going was really hard, a combination of driving rain in my face, strong gusty winds, a muddy and slippery path, and a very heavy pack, plus of course a route that went up and down more times than an escalator. Very early in the day I climbed up and over Pen Yr Afr, the highest point of the whole walk at over 575 feet, with its amazing folded strata. The day quickly became a bit of a slog and I just put my head down and kept walking, trying as best I could to keep the stinging rain off my face. Taking photographs was difficult as the camera got soaked every time I took it out of its bag. It seemed cruel because this was potentially the best and most rugged part of the whole walk and I couldn’t fully enjoy it because visibility was limited and besides, I had to watch my feet constantly. I needn’t have worried, there were many more rugged parts to come! The guide book had already warned me that the far northern section was the hardest with very steep climbs and slippery descents and in fact there were virtually no flat parts at all. 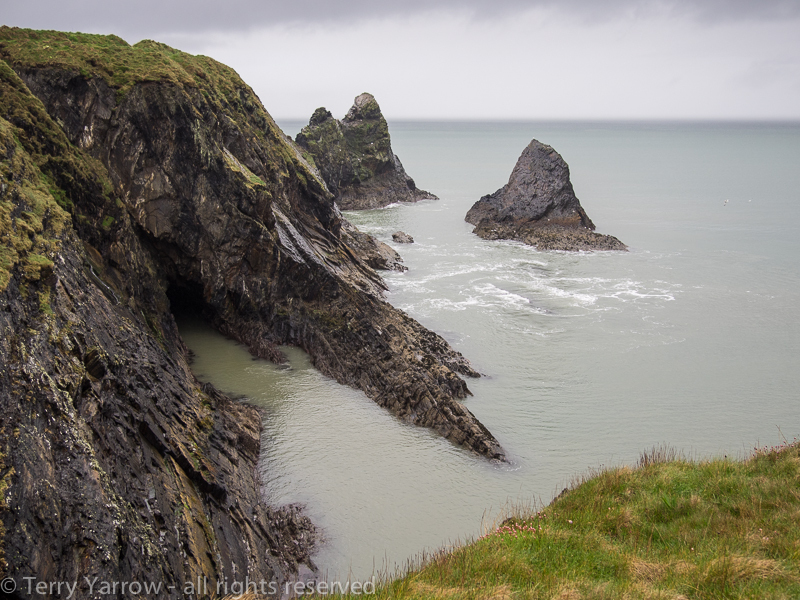 Weaving in and out of various inlets and rocky outcrops, I passed Carreg Wylan Stacks. 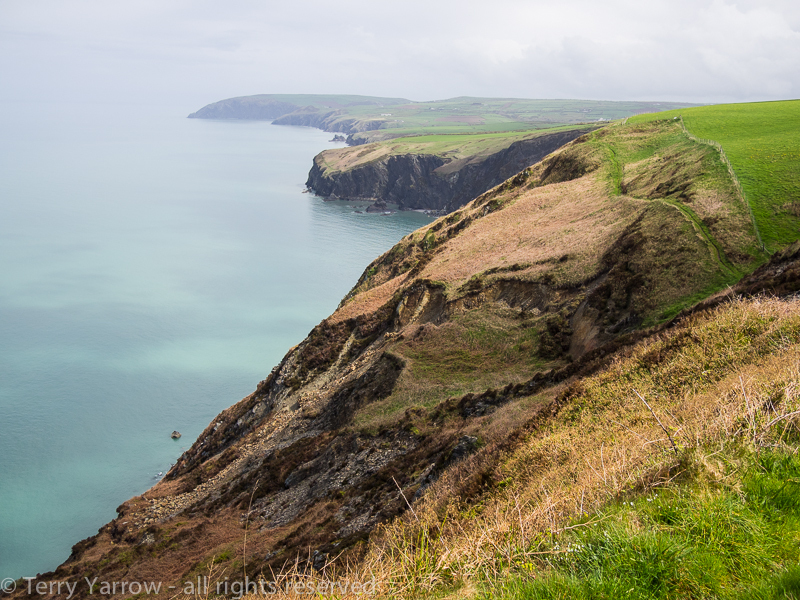 These just seemed to typify this coastline, a switchback of rugged rock formations. 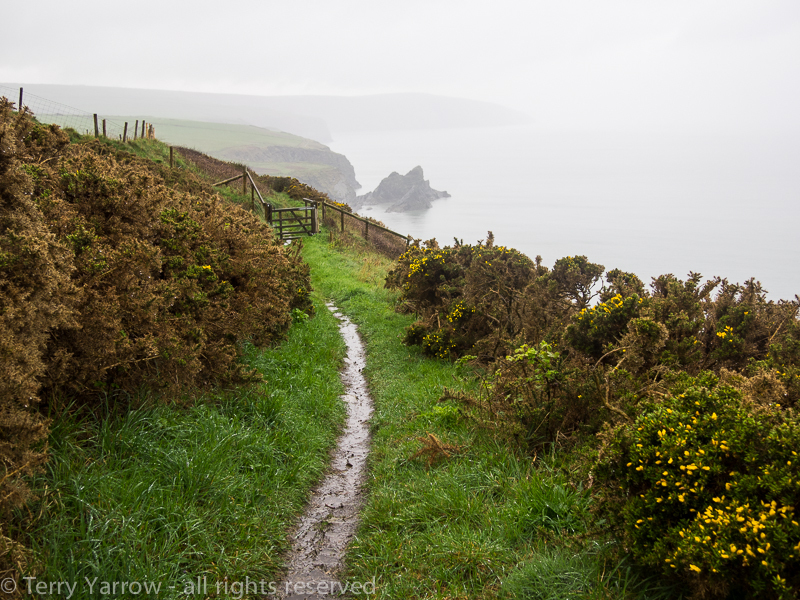 Despite the rugged beauty of the coastline, it became a challenge to just reach my campsite at the end of the day, such was the ferocity of the wind and rain – and I wondered why I was doing it! A signpost rubbed my nose in it by reminding me that I still had 81/2 miles to walk! Then in the afternoon the rain stopped, visibility gradually improved, and finally the sun made an appearance – and I knew why I was doing it! The scenery was breathtaking and the ruggedness was picked out by the sun slanting across the landscape. It didn’t make the pack any lighter or the climbs any less steep, but it helped. Mid afternoon, with aching muscles, I walked into Newport knowing that I only had a mile or two to walk to reach my camp for the night. I had met few walkers during the day, well only one in fact, a young girl who admitted that she was a ‘fair weather walker’ who had only set out when the rain cleared. Late afternoon I pitched my tent in a wonderful spot with amazing views across Newport Sands and the coastline I had walked during the day. What a day, what a start! The expression ‘jumping in at the deep end’ came to mind! Would I describe it as a great day? Yes definitely because I had a real sense of achievement at having made it through despite the conditions. But more than that, the conditions I had walked in somehow really suited this rugged coastline and brought out its character in a way that the sun can’t do. I had been concerned because this first day is said to be the most challenging part of the whole walk, not what you want to hear when you have arthritic knees and ankles. I had feared that I might not be able to make it but in the end, they caused me no problems at all. 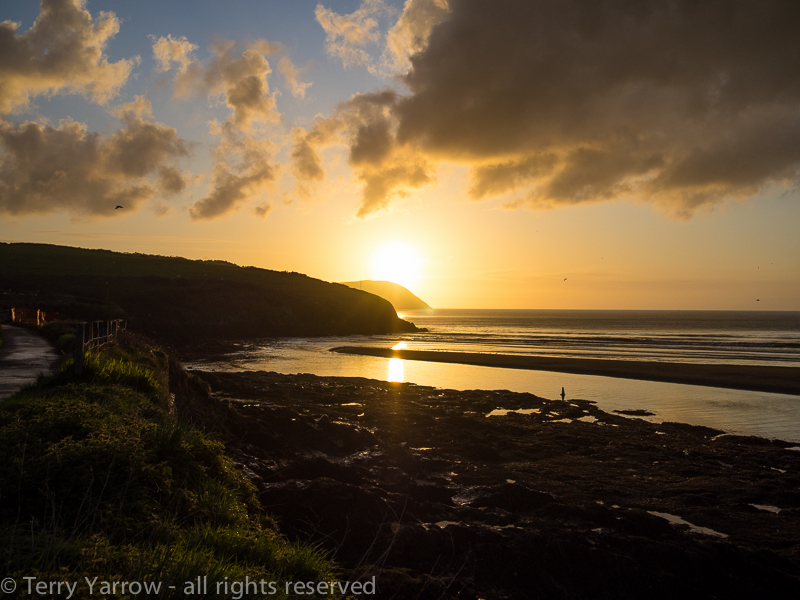 I was a happy man as I sat and watched the sun go down over the Pembrokeshire Coast, and settled back into my tent for the night. The day dawned with a beautiful sunrise, a welcome sight after yesterday’s rain. Having breakfasted and packed, I put on my still sodden shoes and set out along the coast again, feeling slightly stiff from my efforts of yesterday. It didn’t take long to reach my first stopping point of the day, Cwm-Yr-Eglwys (the valley of the church), with its ruined church right on the edge of the water. 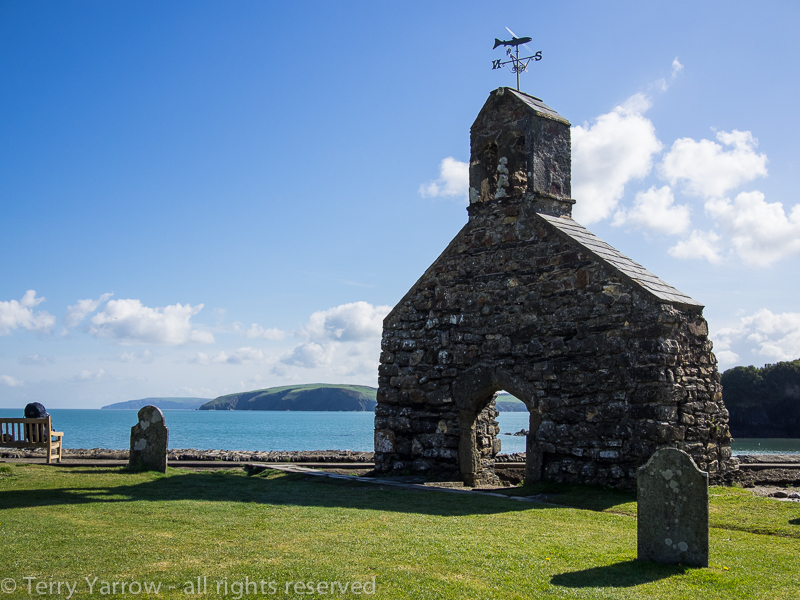 The church had served the local hamlet and once seated 300 but coastal erosion had been its downfall. This was such a beautiful spot and I sat for a while just drinking in the warm sunshine and the lovely view across the bay. 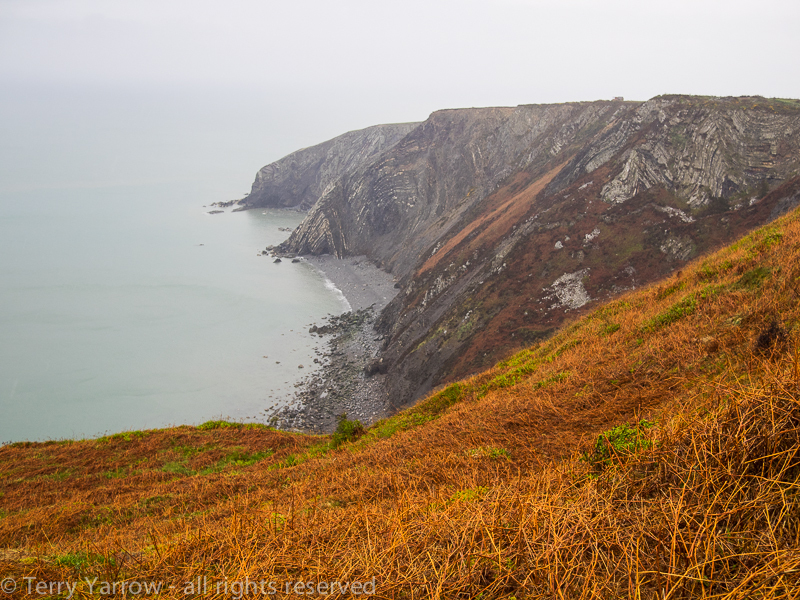 Today’s main feature was to be the climb up and over Dinas Island, not an island at all but a headland. Distinctively shaped like a 50p coin but with five sides, the headland has one side connected to the land and four surrounded by sea. It would be a short and fairly level hop to walk the one side attached to the land but I knew I would regret it if I didn’t walk all around the whole headland although this proved a hard walk with steep climbs over the highest point, Pen Y Fan at 466 feet. The views more than made up for the effort needed though. 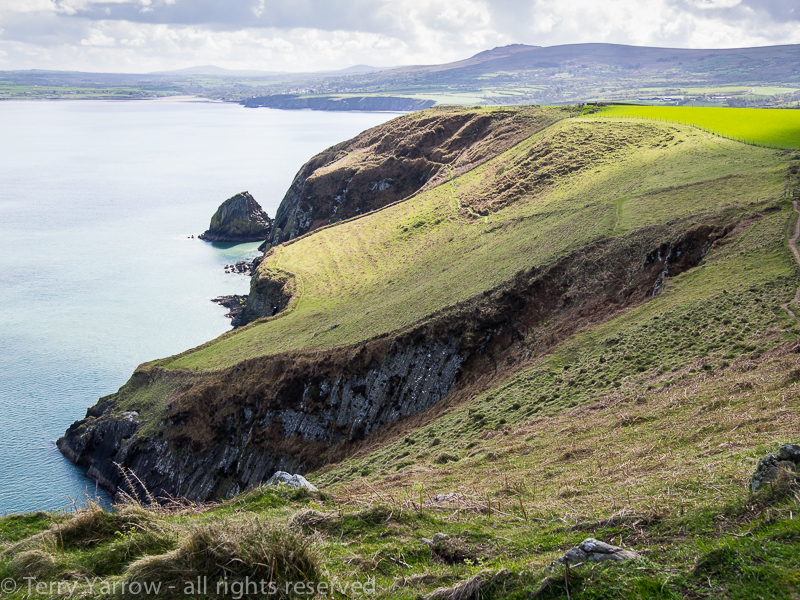 I passed a few walkers on route as this particular headland makes a very nice day walk, although I had still not met any other ‘end to enders’. Dropping down off the high headland, I reached Pwllgwaelod (don’t you just love these Welsh names), a lovely bay from which I could view the coastline that would be my companion for several hours. 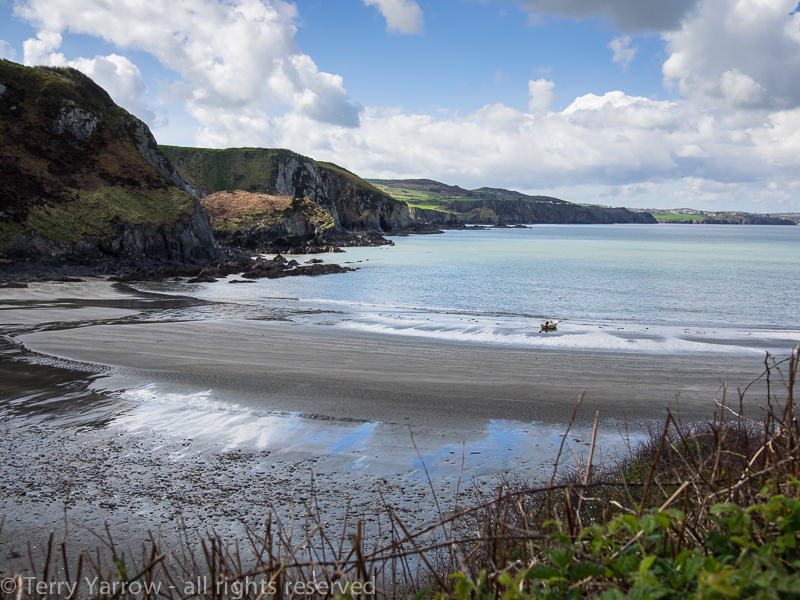 One of the features of this coast is that you can often see where you are headed in the distance but it seems to take an age to reach it because of the constant ups and downs and the constant weaving in and out of a million coves and inlets. This is of course its charm and beauty as well, an ever changing landscape. 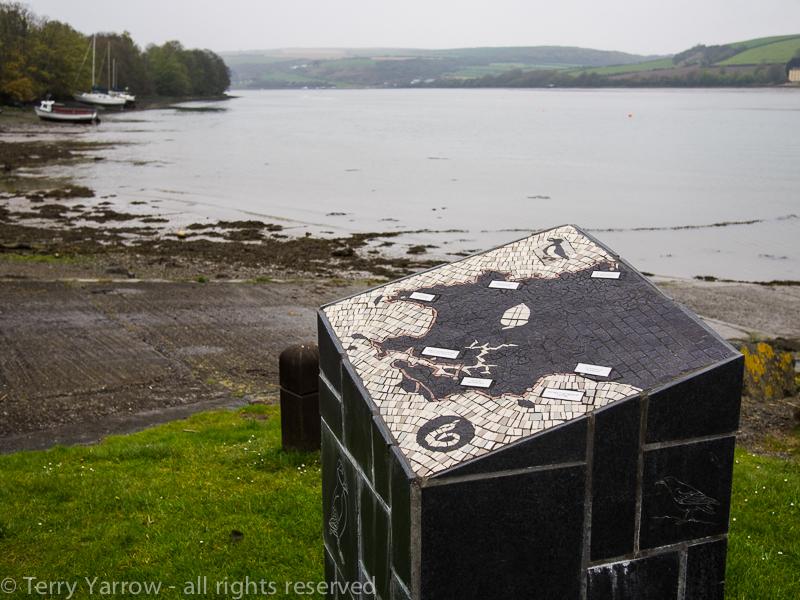 I had set myself a task to not take a break until I reached Fishguard so it was something of a relief to arrive at the old fort that marks the start of Fishguard’s three towns – Lower Town, the newer Fishguard town, and Goodwick. 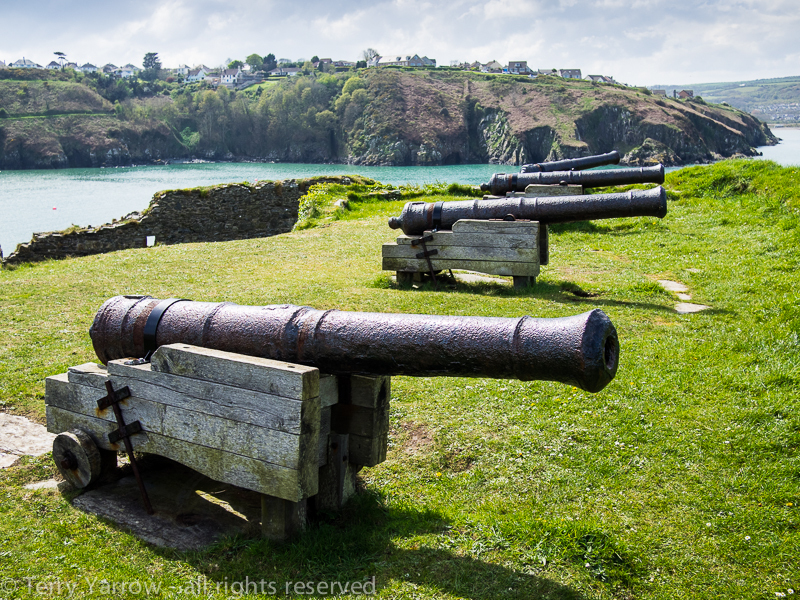 Fishguard Fort was built in 1781 to defend the community against privateers but it is now in ruins. Nevertheless, it occupies a delightful position. 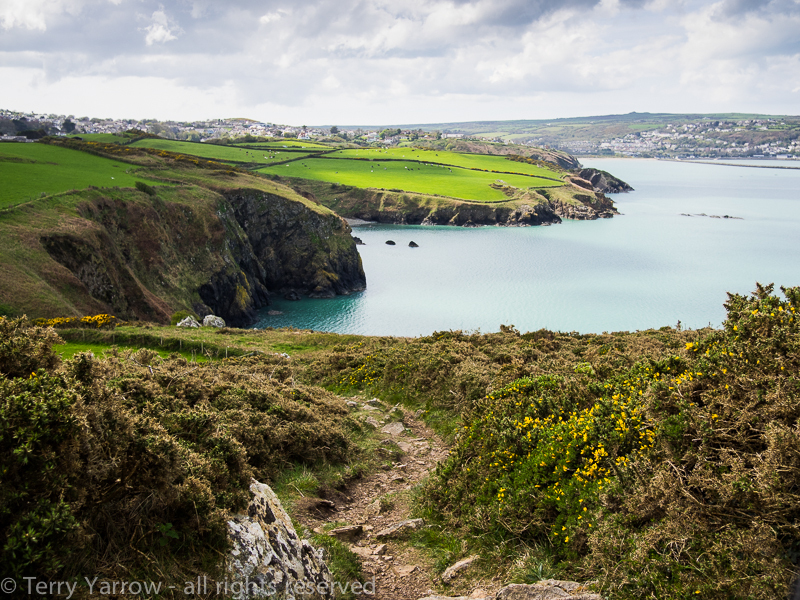 The Lower Town, the oldest part, is particularly picturesque with its old harbour, once a thriving herring fishing, ship building and coastal trading centre, and the walk through the town and around the next headland along the Marine Walk was equally lovely with wonderful views across the bay. 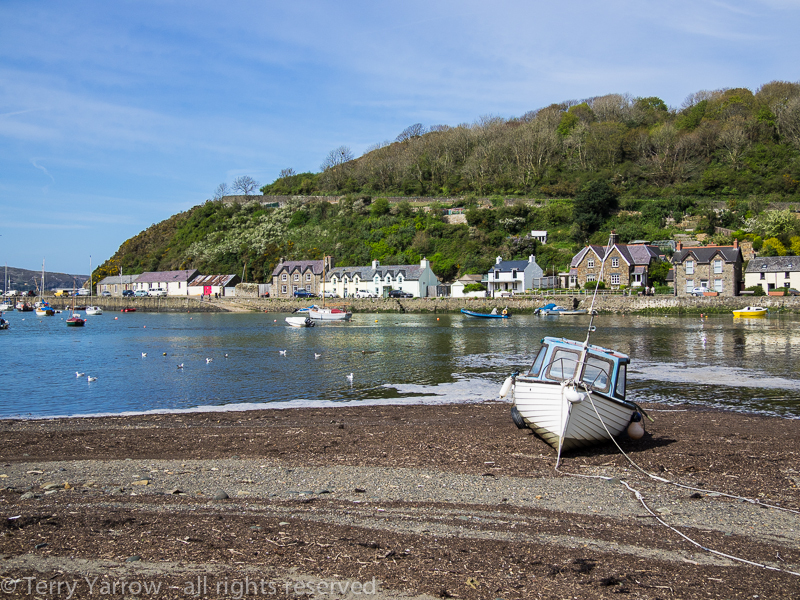 The newer part of Fishguard which operates a ferry service to Ireland was perhaps less inspiring so I hurried through, just stopping for food on the way. At this point I only had a few miles to walk to reach my overnight stopping point but as is often the case, those miles seemed to take a long time to walk. 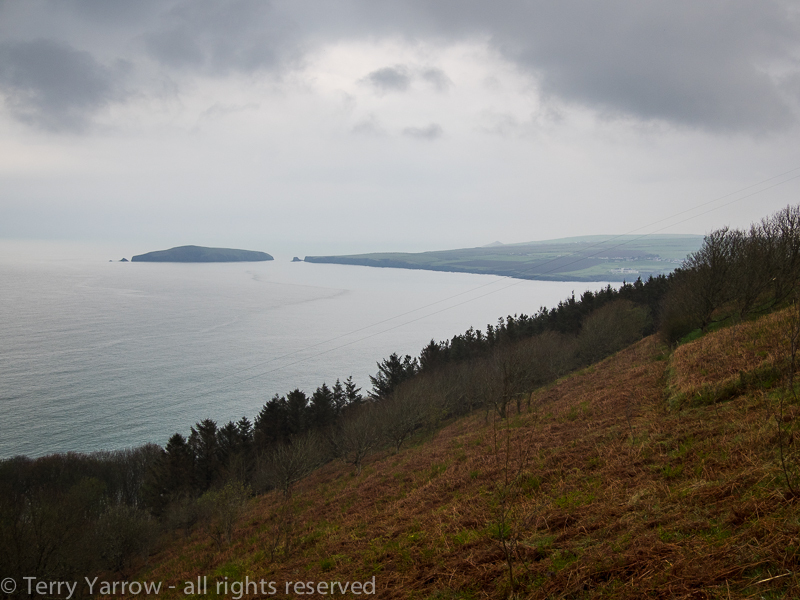 The climb out of Fishguard/Goodwick was steep but once on the high headland, the path levelled off slightly for a time, probably the first ‘flat’ part since the start two days ago. Walking in the late afternoon sun was lovely and the scenery continued to be as beautiful as ever. 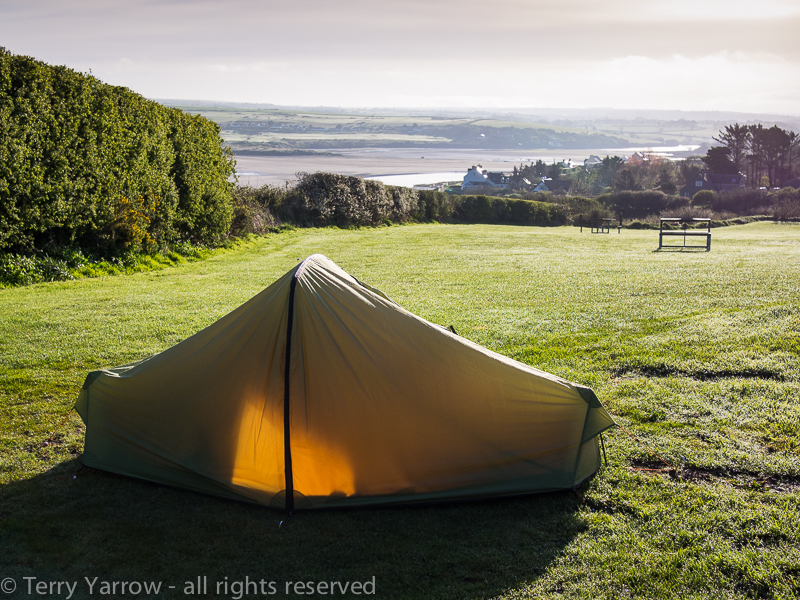 Just short of Strumble Head, I turned inland to find my campsite – well the term campsite was stretching the truth somewhat. It was actually a field on a farm with no facilities. I was offered the use of the shower (cold!) and toilet in one of the farm cottages but they were hardly five star! I was just glad to have somewhere to pitch my tent for the night, even if it was in the middle of nowhere – in fact, because it was in the middle of nowhere! 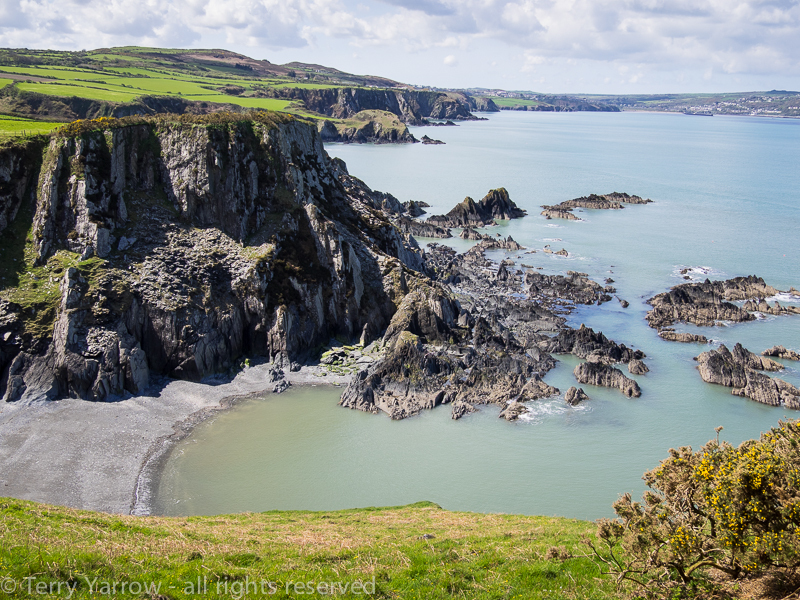 I went to sleep looking forward to another day on the Pembrokeshire Coast Path tomorrow……but that’s for the next blog entry. You’re a glutton for punishment, aren’t you? 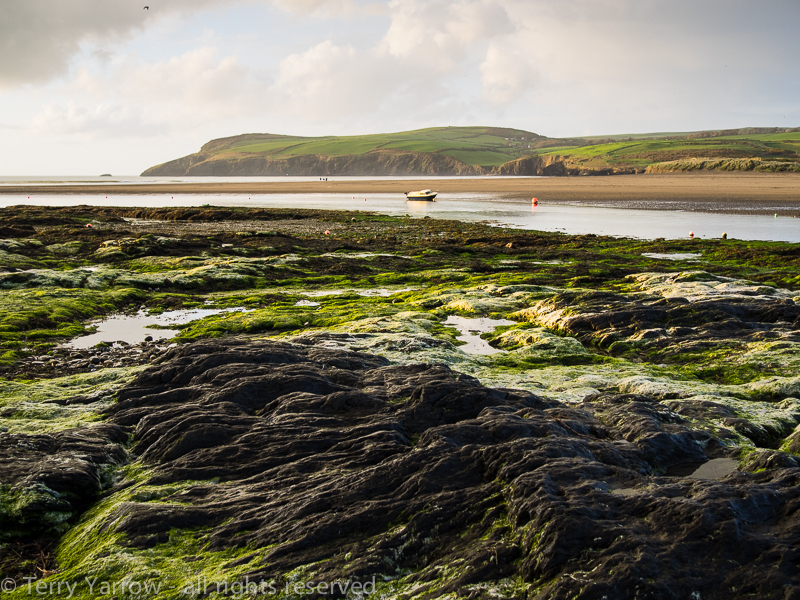 A very beautiful part of the coastline though, and, as usual, lovely photos. I’ve got a cheap raincoat for my camera. Awkward to use but it does the job.